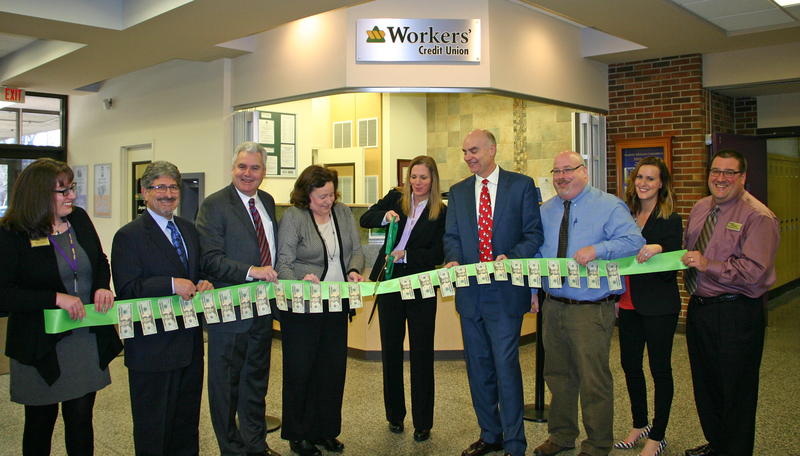 With a snip of the oversized scissors, officials from Montachusett Regional Vocational Technical School Friday ushered in a new era at the grand opening of Workers’ Credit Union’s in-school branch office. The full-service office, located off the school’s main entrance, will serve credit union members, faculty and nearly 1,500 students by providing a range of financial products and services, from a cash dispenser to special checking accounts for students. According to Doug Petersen, president and CEO of Workers’ Credit Union, this is the community credit union’s 17th branch and it's especially important because of the numerous benefits extended to students. “The students enjoy access to cooperative job opportunities and financial literacy resources,” Petersen said. Cooperative job opportunities will be offered to select students, who will work from the branch office every other week for the entire day handling their classmates’ transactions. “We have received very positive feedback from students who have participated in our other in-school branches, ” said Katie Trinque, branch supervisor. The branch will be open on school days, from 8 a.m. to 4 p.m. and on Thursdays until 6 p.m. This is the third in-school branch for the community credit union, with others located in Chelmsford and Acton. This is a good initiative taken. Vocational institute in Fitchburg, Massachusetts will bring out skilled work force and help the people of Fitchburg in employment. Everyone should give priority to college education but if they are not getting there than vocational institutes are the best option. Opening of a new branch is always welcoming. However, every stakeholder, customer and all those connected with the business should understand that it is not something easy. Expanding businesses or even institutes requires a lot of hard work from the entire team. Then imagine how difficult it is going to be to think about starting something new totally. Education for instance started online program where people were rewarded fast online degrees and it is totally re-shaping or re-structuring the world of education. All these things are possible with pure dedication and passion. Vocational Technical Schools are actually really helpful because they give you on the job experience and most include a co-op which looks really good when you're applying to jobs. The programs prepare you really well for careers because it's real life experience as well as the education and it's free. Mostly online assignment writing UK companies also refers student to vocational schools.